Meta-analysis is a statistical procedure that integrates the results of several independent studies considered to be “combinable.”1 Well conducted meta-analyses allow a more objective appraisal of the evidence than traditional narrative reviews, provide a more precise estimate of a treatment effect, and may explain heterogeneity between the results of individual studies.2 Ill conducted meta-analyses, on the other hand, may be biased owing to exclusion of relevant studies or inclusion of inadequate studies.3 Misleading analyses can generally be avoided if a few basic principles are observed. In this article we discuss these principles, along with the practical steps in performing meta-analysis. Meta-analysis should be viewed as an observational study of the evidence. The steps involved are similar to any other research undertaking: formulation of the problem to be addressed, collection and analysis of the data, and reporting of the results. Researchers should write in advance a detailed research protocol that clearly states the objectives, the hypotheses to be tested, the subgroups of interest, and the proposed methods and criteria for identifying and selecting relevant studies and extracting and analysing information. As with criteria for including and excluding patients in clinical studies, eligibility criteria have to be defined for the data to be included. Criteria relate to the quality of trials and to the combinability of treatments, patients, outcomes, and lengths of follow up. Quality and design features of a study can influence the results.4 5 Ideally, researchers should consider including only controlled trials with proper randomisation of patients that report on all initially included patients according to the intention to treat principle and with an objective, preferably blinded, outcome assessment.6 Assessing the quality of a study can be a subjective process, however, especially since the information reported is often inadequate for this purpose.7 It is therefore preferable to define only basic inclusion criteria and to perform a thorough sensitivity analysis (see below). The strategy for identifying the relevant studies should be clearly delineated. In particular, it has to be decided whether the search will be extended to include unpublished studies, as their results may systematically differ from published trials. As will be discussed in later articles, a meta-analysis that is restricted to published evidence may produce distorted results owing to such publication bias. For locating published studies, electronic databases are useful,8 but, used alone, they may miss a substantial proportion of relevant studies.9 10 In an attempt to identify all published controlled trials, the Cochrane Collaboration has embarked on an extensive manual search of medical journals published in English and many other languages.11 The Cochrane Controlled Trials Register12 is probably the best single electronic source of trials; however, citation indices and the bibliographies of review articles, monographs, and the located studies should also be scrutinised. Individual results have to be expressed in a standardised format to allow for comparison between studies. If the end point is continuous—for example, blood pressure—the mean difference between the treatment and control groups is used. The size of a difference, however, is influenced by the underlying population value. An antihypertensive drug, for example, is likely to have a greater absolute effect on blood pressure in overtly hypertensive patients than in borderline hypertensive patients. Differences are therefore often presented in units of standard deviation. If the end point is binary—for example, disease versus no disease, or dead versus alive) then odds ratios or relative risks are often calculated (box). The odds ratio has convenient mathematical properties, which allow for ease in combining data and testing the overall effect for significance. Absolute measures, such as the absolute risk reduction or the number of patients needed to be treated to prevent one event,17 are more helpful when applying results in clinical practice (see below). Odds ratio or relative risk? The odds is the number of patients who fulfil the criteria for a given endpoint divided by the number of patients who do not. For example, the odds of diarrhoea during treatment with an antibiotic in a group of 10 patients may be 4 to 6 (4 with diarrhoea divided by 6 without, 0.66); in a control group the odds may be 1 to 9 (0.11) (a bookmaker would refer to this as 9 to 1). The odds ratio of treatment to control group would be 6 (0.66÷0.11). The risk is the number of patients who fulfil the criteria for a given end point divided by the total number of patients. In the example above the risks would be 4 in 10 in the treatment group and 1 in 10 in the control group, giving a risk ratio, or relative risk, of 4 (0.4÷0.1). Some statisticians feel that other statistical approaches are more appropriate than either of the above. One approach uses Bayes's theorem, named after an 18th century English clergyman.21 Bayesian statisticians express their belief about the size of an effect by specifying some prior probability distribution before seeing the data, and then they update that belief by deriving a posterior probability distribution, taking the data into account.22 Bayesian models are available under both the fixed and random effects assumption.23 The confidence interval (or more correctly in bayesian terminology, the 95% credible interval, which covers 95% of the posterior probability distribution) will often be wider than that derived from using the conventional models because another component of variability, the prior distribution, is introduced. Bayesian approaches are controversial because the definition of prior probability will often be based on subjective assessments and opinion. Results from each trial are usefully graphically displayed, together with their confidence intervals. Figure 3 represents a meta-analysis of 17 trials of ß blockers in secondary prevention after myocardial infarction. Each study is represented by a black square and a horizontal line, which correspond to the point estimate and the 95% confidence intervals of the odds ratio. The 95% confidence intervals would contain the true underlying effect in 95% of the occasions if the study was repeated again and again. The solid vertical line corresponds to no effect of treatment (odds ratio 1.0). If the confidence interval includes 1, then the difference in the effect of experimental and control treatment is not significant at conventional levels (P>0.05). The area of the black squares reflects the weight of the study in the meta-analysis. The confidence interval of all but two studies cross this line, indicating that the effect estimates were non-significant (P>0.05). The diamond represents the combined odds ratio, calculated using a fixed effects model, with its 95% confidence interval. The combined odds ratio shows that oral ß blockade starting a few days to a few weeks after the acute phase reduces subsequent mortality by an estimated 22% (odds ratio 0.78; 95% confidence interval 0.71 to 0.87). A dashed line is plotted vertically through the combined odds ratio. This line crosses the horizontal lines of all individual studies except one (N). This indicates a fairly homogenous set of studies. Indeed, the test for heterogeneity gives a non-significant P value of 0.2. A logarithmic scale was used for plotting the odds ratios in figure 3. There are several reasons that ratio measures are best plotted on logarithmic scales.25 Most importantly, the value of an odds ratio and its reciprocal—for example, 0.5 and 2—which represent odds ratios of the same magnitude but opposite directions, will be equidistant from 1.0. Studies with odds ratios below and above 1.0 will take up equal space on the graph and thus look equally important. Also, confidence intervals will be symmetrical around the point estimate. Meta-analysis using absolute effect measures such as the risk difference may be useful to illustrate the range of absolute effects across studies. The combined risk difference (and the number needed to treat calculated from it) will, however, be essentially determined by the number and size of trials in patients at low, intermediate, or high risk. Combined results will thus be applicable only to patients at levels of risk corresponding to the average risk of the trials included. It is therefore generally more meaningful to use relative effect measures for summarising the evidence and absolute measures for applying it to a concrete clinical or public health situation. Opinions will often diverge on the correct method for performing a particular meta-analysis. The robustness of the findings to different assumptions should therefore always be examined in a thorough sensitivity analysis. This is illustrated in figure 4 for the meta-analysis of ß blockade after myocardial infarction. Firstly, the overall effect was calculated by different statistical methods, by using both a fixed and a random effects model. The 4 shows that the overall estimates are virtually identical and that confidence intervals are only slightly wider with the random effects model. This is explained by the relatively small amount of variation between trials in this meta-analysis. Secondly, methodological quality was assessed in terms of how patients were allocated to active treatment or control groups, how outcome was assessed, and how the data were analysed.6 The maximum credit of nine points was given if patient allocation was truly random, if assessment of vital status was independent of treatment group, and if data from all patients initially included were analysed according to the intention to treat principle. Figure 4 shows that the three low quality studies (≤7 points) showed more benefit than the high quality trials. Exclusion of these three studies, however, leaves the overall effect and the confidence intervals practically unchanged. Thirdly, significant results are more likely to get published than non-significant findings,28 and this can distort the findings of meta-analyses. The presence of such publication bias can be identified by stratifying the analysis by study size—smaller effects can be significant in larger studies. If publication bias is present, it is expected that, of published studies, the largest ones will report the smallest effects. 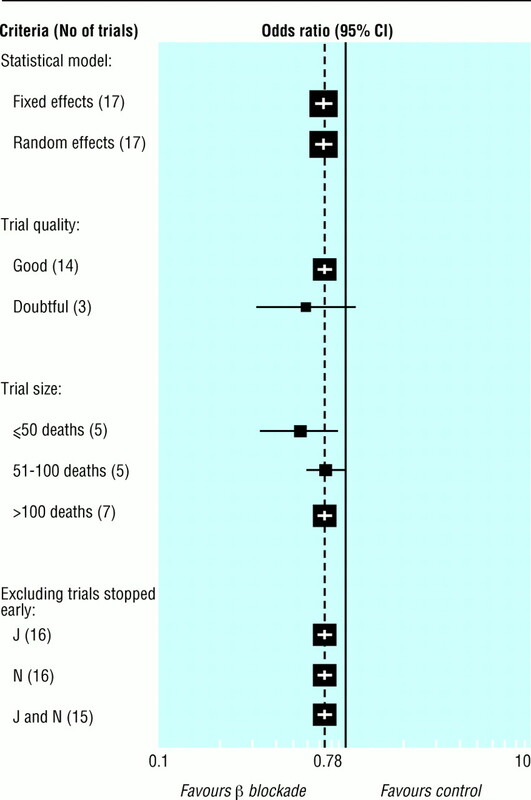 Figure 4 shows that this is indeed the case, with the smallest trials (50 or fewer deaths) showing the largest effect. However, exclusion of the smallest studies has little effect on the overall estimate. Finally, two studies (J and N; see 3) were stopped earlier than anticipated on the grounds of the results from interim analyses. Estimates of treatment effects from trials that were stopped early are liable to be biased away from the null value. Bias may thus be introduced in a meta-analysis that includes such trials.29 Exclusion of these trials, however, affects the overall estimate only marginally. The sensitivity analysis thus shows that the results from this meta-analysis are robust to the choice of the statistical method and to the exclusion of trials of poorer quality or of studies stopped early. 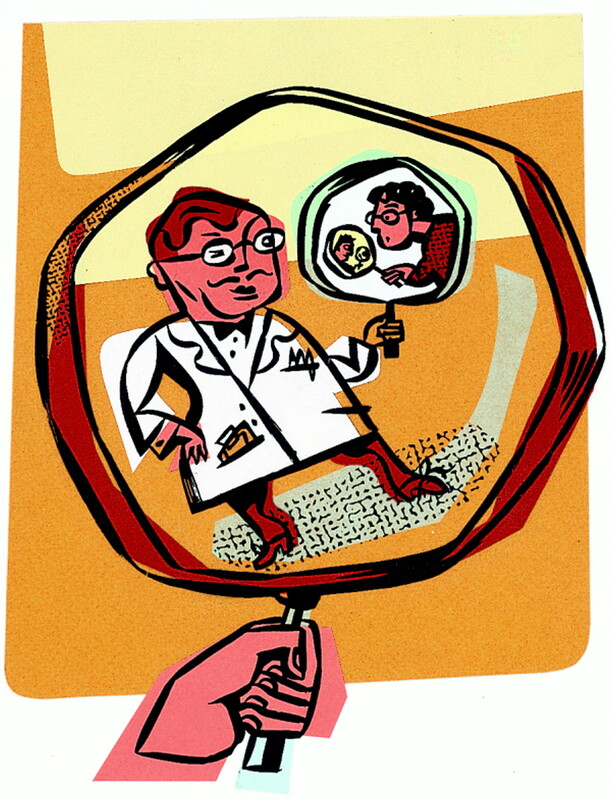 It also suggests that publication bias is unlikely to have distorted its findings. Meta-analysis should be seen as structuring the processes through which a thorough review of previous research is carried out. The issues of completeness and combinability of evidence, which need to be considered in any review,30 are made explicit. Was it sensible to have combined the individual trials that comprise the meta-analysis? How robust is the result to changes in assumptions? Does the conclusion reached make clinical and pathophysiological sense? Finally, has the analysis contributed to the process of making rational decisions about the management of patients? It is these issues that we explore further in later articles in this series. The department of social medicine at the University of Bristol and the department of primary care and population sciences at the Royal Free Hospital School of Medicine, London, are part of the Medical Research Council's health services research collaboration. .Meta-analysis: potentials and promise.BMJ 1997;315: 1371–4. .Randomized versus historical controls for clinical trials.Am J Med 1982;72: 233–40. .Empirical evidence of bias. Dimensions of methodological quality associated with estimates of treatment effects in controlled trials.JAMA 1995;273: 408–12. .The effects of routine oxytocic administration in the management of the third stage of labour: an overview of the evidence from controlled trials.Br J Obstet Gynaecol 1988;95: 3–16. .Improving the quality of reporting of randomized controlled trials. The CONSORT statement.JAMA 1996;276: 637–9. .The Medline database.BMJ 1997;315: 180–3. .Perusing the literature: comparison of Medline searching with a perinatal clinical trial data base.Controlled Clinical Trials 1985;6: 306–317. .Identifying relevant studies for systematic reviews.BMJ 1994;309: 1286–91. The Cochrane Controlled Trials Register. In: Cochrane Library. CD ROM and online. Cochrane Collaboration (issue 1). Oxford: Update Software,1997. .Assessing the quality of randomized controlled trials: an annotated bibliography of scales and checklists.Controlled Clinical Trials 1995;16: 62–73. .Assessing the quality of reports of randomized clinical trials: is blinding necessary?Controlled Clinical Trials 1996;17: 1–12. .Problems induced by meta-analyses.Stat Med 1991;10: 971–80. .Completeness of reporting of trials published in languages other than English: implications for conduct and reporting of systematic reviews.Lancet 1996;347: 363–6. .An assessment of clinically useful measures of the consequences of treatment.New Engl J Med 1988;318: 1728–33. .A comparison of statistical methods for combining event rates from clinical trials.Stat Med 1989;8: 141–51. .Beta blockade during and after myocardial infarction: an overview of the randomized trials.Prog Cardiovasc Dis 1985;17: 335–71. .Meta-analysis in clinical trials.Controlled Clinical Trials 1986;7: 177–88. .Meta-analysis for 2x2 tables: a bayesian approach.Stat Med 1992;11: 141–58. .The statistical basis of public policy: a paradigm shift is overdue.BMJ 1996;313: 603–7. .Meta-analysis by the confidence profile method. The statistical synthesis of evidence. Boston: Academic Press,1992. .Inter-study differences: how should they influence the interpretation and analysis of results?Stat Med 1987;6: 351–8. .Risk stratification and survival after myocardial infarction.New Engl J Med 1983;309: 331–6. .The number needed to treat: a clinically useful nomogram in its proper context.BMJ 1996;312: 426–9. 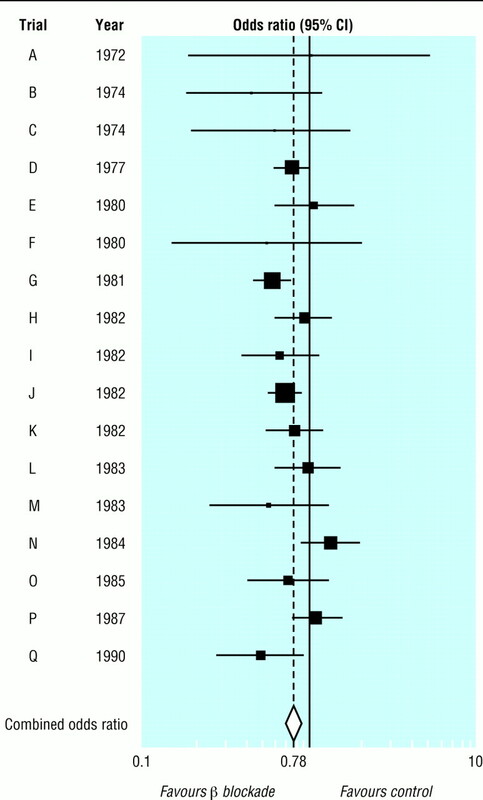 .Effects on overviews of early stopping rules for clinical trials.Stat Med 1987;6: 361–7. .Checklists for review articles.BMJ 1994;309: 648–51.